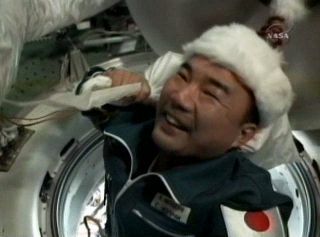 Japanese astronaut Soichi Noguchi floats through the passageway from the Soyuz TMA-17 spacecraft into the International Space Station shortly after docking Dec. 22, 2009. Christmas comes twice to the astronauts aboard theInternational Space Station this year as the multi-nation crew celebrates thetraditional Dec. 25 holiday as well as Russian Orthodox Christmas on Jan. 7. Current station commander Jeff Williams of NASA is leading acrew of five, including Russian cosmonauts Maxim Suraev and Oleg Kotov,Japanese astronaut Soichi Noguchi, and American spaceflyer Timothy"T.J." Creamer. Kotov, Noguchi and Creamer arrived just recently, docking atthe station aboard the Russian Soyuz TMA-17 spacecraft on Tuesday. "We're privileged this time of year to be in thisunique place looking back at our planet," Williams said in a video beameddown from the orbiting outpost. "It's a time for us to be thinking aboutour family and friends? It's also a time to look forward to the future year,finishing the assembly of the International Space Station."? Each year, the crew gets to choose when to hold theirofficial holidayfeast, during which they gather to share special delicacies beyond thescope of their normal daily rations. This year, the spaceflyers have all elected to take AmericanChristmas and American New Year's as their official holidays, NASA spokesmanKelly Humphries said. Nonetheless, there will likely be some festivities on allthe upcoming occasions, including the Russian Christmas.? "They'll probably celebrate a little on both,"NASA spokesman Josh Byerly said. The special treats for Dec. 25 include smoked turkey,candied yams, green beans with mushrooms, and cornbread dressing. "There's the traditional food, and also I think thatSoichi is bringing up some Japanese food, and of course they have the Russianfood," Byerly said. That day will be a particularly light one, with minimalduties scheduled for the astronauts. They will have a chance to make phonecalls and send e-mails back home, and of course, enjoy their meals. "They gather around the table and kind of break out allthe food," Byerly told SPACE.com. "They probably barter with oneanother and trade different foods. It?s a big feast." Christmas has a storied history in space that began with Apollo 8,when astronauts read Genesis from the moon. That year, in 1968, astronautsFrank Borman, Jim Lovell and Bill Anders sent a Christmas Eve broadcast back toEarth showing the now-famous view of Earth rising over the lunar surface. In 1973, the crew aboard the U.S. Skylab space stationconstructed a homemadeChristmas tree out of empty food cans. Later, on Russia's Space Station Mir, NASA astronauts John Blahaand David Wolf celebrated American Christmas in 1996 and 1997, respectively. The crew of space shuttle Discovery's STS-103 mission toservice the Hubble Space Telescope celebrated the holiday by releasing therejuvenated observatory back into space. Since 2000, astronauts have lived continuously on theInternational Space Station and have celebrated the holidays each year.